Iraq has experienced waves of displacement in recent decades, but none compare in size or scale to the flight of Iraqis after the bombing of a Holy Shi’ite shrine in 2006, an event that marked the start of two years of deadly sectarian violence. Over the course of several decades, hundreds of thousands of people were displaced by: the Kurdish revolt of 1975; the atrocities committed against Kurds during former president Saddam Hussein’s Anfal campaign in the late 1980s; Hussein’s forced relocation policies, which attempted to shift the demographic balance of specific areas in favour of Sunni Arabs; and the first Gulf war in 1991. Another 190,000 people were displaced in the first two years of the American-led invasion, from 2003 to 2005, according to estimates by aid workers at the time. By 2006, an estimated 1.2 million people were internally displaced people in Iraq. The 2006 Samarra mosque bombing set off what the UN Refugee Agency (UNHCR) called at the time the largest population movement in the Middle East since 1948. Some 1.6 million people fled internally, according to the International Organization for Migration, and an estimated 2.2 million became refugees, escaping mainly to Syria and Jordan. As such, at the height of the civil conflict in Iraq, 2006 to 2007, nearly five million Iraqis had left their homes. Today, nearly one million Iraqis are still living as refugees in neighbouring countries, according to government estimates, with more than 126,000 of them registered with UNHCR. That number was even higher before the conflict erupted in Syria, which forced tens of thousands of Iraqi refugees to return to their homes, perhaps prematurely. Another 1.1 million remain internally displaced persons (IDPs) within Iraq, according to the latest figures from the Ministry of Displacement and Migration. Many of them live in slum-like settlements, with no clear government policy to address their future. Some researchers have even higher estimates. “Perhaps three million people, 10 percent of Iraq's population, remain displaced - and forgotten,” Elizabeth Ferris, co-director of the Project on Internal Displacement run by the Brookings Institution and the London School of Economics, wrote last month. Localized violence along the disputed boundaries between Iraq and its autonomous Kurdistan region, as well as drought and desertification, have continued to force small numbers of Iraqis to leave their homes in recent years. At the same time, in the last couple years, the number of people returning from displacement has increased. But these returnees often struggle to make ends meet. A UNHCR survey in late 2010 showed that 87 percent of returnees could not make enough money to support their families. 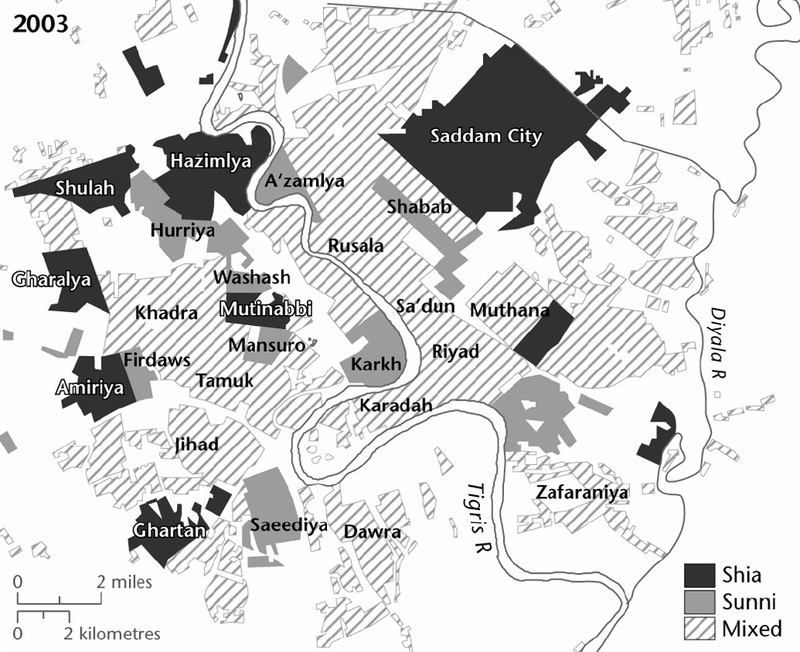 Displacement trends have also left much of Iraq divided along sectarian lines. “Today, the governorates and neighbourhoods which were most affected by displacement are now more ethnically or religiously homogenous than at any time in Iraq’s history,” the Internal Displacement Monitoring Centre wrote in 2010. For more, take a look at the Internal Displacement Monitoring Centre’s comprehensive report on the history of forced displacement in Iraq; IOM’s assessment of the condition of IDPs, five years after their displacement; and this research by Iraqi professor Omar Dewachi on displacement as part of the Costs of War project.